In part, this can be attributed to the fact that Slovakia’s dissident movement was not really a movement, but a small group of eccentrics, among whom the Christian Democrat Ján Čarnogurský was an absolute hermit. The situation was thus even worse than in Czechia. Further, the Slovaks did not possess a strong émigré movement. Their émigré anti-communists—as in the case of Croats, Ukrainians, and Belarusians—were often tainted by prior collaboration with the Germans. The ideas of Father Tiso lived on in the realm of national symbols and no serious attempt was made to consciously purge Slovak nationalism of certain National Socialist accretions. Other émigré orientations were even more eclectic. Then the “Velvet Revolution” occurred: primarily in Bohemia, but also in Slovakia. Bratislava witnessed anti-regime protests by Slovaks demanding that the communists abandon power. But the latter merely hid. Most of them actually claimed that, in reality, they had never been communists, and offered the democrats their services as “professionals.” To camouflage themselves, they repeated pro-independence and—naturally—liberal slogans. Soon, different parties appeared, including a post-communist one, which operated like a private firm. The party’s statute made it impossible to remove its leadership. Such impunity passed without protests, and the first signs of a red resurgence appeared already after the “Velvet Divorce” and the establishment of an independent Slovak state. Čarnogurský was removed from the prime-ministerial seat he held within the Czechosloviak federation. The halting of privatization and re-privatization was even more significant, however. The latter, of course, should not be confused with property restitution, which never took place anyway. Czechoslovak re-privatization was based on a system of bonds enabling citizens to apply for the ownership of small enterprises that had been stolen by the communist regime after 1945. In the Czech Republic, many took advantage of the program, unlike in Slovakia. Following the Velvet Divorce, the new post-communist premier, Vladimír Mečiar, put a stop to the entire project. Slovakia’s post-communists reasoned that—having infiltrated the liberals, social democrats, and even nationalists—in addition to securing their own leadership a permanent hold on the party, it was imperative to prevent the emergence of a Slovakian middle class. After all, a stratum of wealthy citizens disposing of their own, independent wealth, could use their resources to challenge and unseat the corrupt, post-communist kleptocracy. The mini-re-privatization had to be halted, as did privatization—lest foreign investors find Slovak partners with no ties to the post-communists. Since most of the managers of state enterprises had been Party members, the curtailment of privatization would ensure the retention of economic power in post-communist hands. In effect, the communists never truly “lost” power, since many also remained in government posts and institutions. Thus, Russia has great influence in Slovakia. In 2010, Slovakia sold $2 billion worth of goods to Russia, while importing $6 billion—mostly energy resources. The energy market was taken over by Slovrusgas. Slovakia is a “second Cyprus,” and its banking system is dominated by Sbierbank, which is often considered an arm of the Kremlin’s clandestine services. The Russians also control the energy sector, their influence extending even into Slovak education. The Pan-European Legal School, a kind of leadership academy, is Moscow’s bridgehead in the Carpathian republic. “Slovakia is mainly an export market and a transit corridor,” stated Dr. Bajda. In light of the above, Slovakia’s post-communist transformation is much closer to the Ukrainian model, rather than the Czech one. Post-communist “good old boy” networks remain untouched. In the field of foreign relations, personal contacts with the Soviets were converted into personal ties with the Russians. Even as the older generation of communists disappears, the younger cadres are quite successful. One example is the current prime minister, the “social democratic” Robert Fico. Born in 1964, he joined the Party in 1988. After 1989, Fico attempted to ingratiate himself with Moscow, but was ignored; there were plenty of other pro-Russian clients among Slovakia’s post-communists for Moscow to choose from. Fico rose to fame only recently, and only then were his efforts noticed by the Kremlin. Fico supported Putin during Russia’s invasion of Georgia in August 2008. In the European Union, he delicately boycotted the Via Carpathia initiative (extending from the Baltic to Greece) and supported Russian energy blackmail against Ukraine. At the same time, he has sought out alternative energy sources in the form of shale gas and the construction of pipeline connectors, which are promoted by the Vyšehrad Group. This is probably geared mainly to Slovak voters. After all, Russia can’t deliver energy to Slovakia via an air lift. Fico’s internal policies are also quite cunning. On the one hand, he has utilized the nationalists while posing as a “national bolshevik.” He outmaneuvered his former partners from the Slovak National Party by appropriating their anti-Hungarian and anti-Roma slogans, albeit in a much more subtle way. (Interestingly, ethnic minorities have for a long time formed coalitions in Bratislava with the right, not the left.) At the level of symbols, Fico invokes Slovak nationalism. For instance, monuments to Prince Svatopluk I and Father Andrej Hlinka (a liberal nationalist) have recently been erected. On the same day, however, Fico dedicated the Ministry of Foreign Affairs building to Vladimir Klementis, a communist. Just like Putin, he attempts to reconcile and blend the communist and non-communist past under the slogan of “we are all patriots.” Fico is more clever, however, since he uses his “social democratism” to win support in the EU as well. For internal consumption, he also praises the legendary Carpathian brigand, Janosik, as the first socialist. 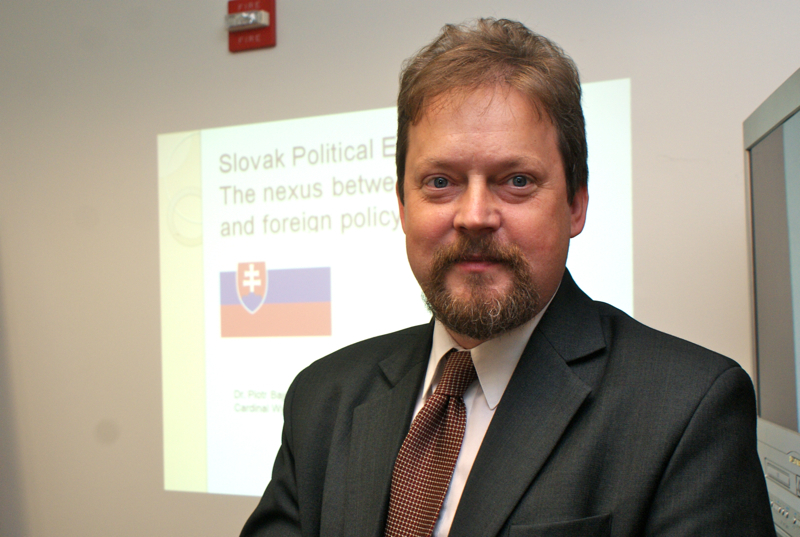 Dr. Bajda’s case study of Slovakia helps to not only understand the process of post-communist transformation in the former Soviet Bloc, but also the problems of transitioning away from totalitarian regimes in general. This entry was posted in Events, Lectures, News, Past Events and tagged Central Europe, Slovakia, Visegrad on October 10, 2013 by IWP.